“Albuquerque”-style, but he doesn’t need a whole lot of time to make a statement. Al’s maiden foray into Hip Hop, the Beastie Boys pastiche/Milton Bradley ode “Twister” lasted a mere sixty three seconds. When Al went a cappella on “Since You’ve Been Gone” it took him a mere eighty seconds to forego the tyranny of instruments completely. And on the UHF soundtrack it took him a mere sixty seven seconds to extol the virtues of one spatula city, where they sell spatulas—and that’s all. 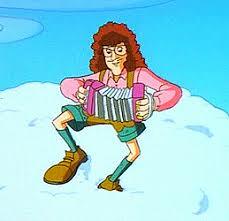 But Al has never crammed more into a tiny amount of time than he did on “The Weird Al Show Theme”, one of many unfairly obscure treasures from the titular program, which ran from September to December in 1997 and that I plan on covering extensively as some of the exclusive content in the book that will eventually result from The Weird Accordion to Al. “The Weird Al Show Theme” consequently has the curious distinction of being at once a real TV show theme for a show that actually existed, albeit for nowhere as long as it should have, and a sly parody of TV show themes. Considering the centrality of television in Al’s oeuvre, it’s unsurprising that while this represents Al’s first theme for a show named after him, it’s not his first theme song. We’re already explored such oddities as Al’s theme song for a TV that ended up not getting picked up (sketch comedy Fun Zone) and, in “Talk Soup”, a theme song for a show that has enjoyed a number of different iterations, none of which, alas, chose to use the nifty theme song Al wrote for them. Al also wrote "UHF", which was not a television show, necessarily, but is a theme song for a movie about television. In classic theme show tradition, “The Weird Al Show Theme” has to work musically while explaining the show's conceit. “The Weird Al Show Theme” sets up the basic premise of the show, which is so insane that it plays like a riotous parody of the ultimate convoluted kid’s show premise: for reasons never explained, Al lives in a cave twenty miles under the earth and after saving a hotshot TV bigwig from a bear trap while sunbathing in a nearby forest is rewarded with his own TV show. That, as they say in the business, is the elevator pitch, the Cliff Notes version, the bare minimum. You’d think that’s all seventy four seconds of time would allow for. You would be wrong. Very, very wrong. The humor in “The Weird Al Show Theme” is rooted partially in in-jokes, in references to hamsters and spatulas and undoubtedly mind-blowing tater tots and accordions that are like little audio Easter eggs for obsessive Al fans, and partially in the comedy of randomness, in funny words and phrases like “nasal decongestant factory” and “lederhosen in a vat of sour cream” and a "mighty fine jelly bean and pickle sandwich." Then there’s the music. Like “You Make Me”, “The Weird Al Show Theme” sounds not just animated but animated in a bunch of weird ways. It’s the audio equivalent to a crazy old stop-motion-animated oddity, with its weird instrumentation and woozy organ grinder vibe. It almost sounds like it’s being sung by Oompah Loompas, a role Al filled in a recent production of Willie Wonka and the Chocolate Factory. “The Weird Al Show Theme” is overflowing with memorable, zany details that turn out to be exquisitely irrelevant. The genius central gag of “The Weird Al Show Theme” is to set up the appropriately surreal and cartoonish premise of “The Weird Al Show” but to do so in a way that all but buries that premise in a hilarious avalanche of seemingly unnecessary and irrelevant details. We learn, for example, that Al used to live in a sewer, then was forced to move to a tree in Ohio, where he worked in a nasal decongestant factory, played on the company’s bowling team and nightly was haunted by a curious dream where he was wearing lederhosen in a vat of sour cream. But none of this is important to the story. Or really matters at all. Ah, but Al has only really gotten started in rambling on and on, stream-of-consciousness style, about things that don’t really have anything to do with the matter at hand. We next learn about our hero meeting a dental hygienist with a spatula tattooed on her arm, something that instantly ceases to matter in our story in any way. “The Weird Al Show Theme” unpacks an enormous amount of information in a very small amount of time, much of it screamingly, comically irrelevant, yet it wraps up so quickly that Al spends the last quarter of the song vamping outrageously, vocally and musically, leading to a comically over-the-top “big finish”, complete with wonderfully over-the-top vocal yowls. So, you see, Al doesn’t need a whole lot of time to realize to a whole bunch of ideas brilliantly. On “The Weird Al Show Theme” he only requires exactly seventy-four seconds to conduct a veritable seminar on silliness.